When I first learnt about BNLF (Stands for Blog Now Live Forever), I was in Europe and wasn’t very sure of my probability of attending it. This event was by Indiblogger and usually their events will be good. It will be fun, some goodies to be won. But BNLF initially sounded too Hi-Fi. Later I checked agenda and speaker profiles. It felt promising. But BNLF was in Mumbai- I had to spend on travel while Indiblogger promised accommodation with their partner Stayzilla. I had drained my savings in Europe and wasn’t very sure if I should spend again on this. I asked myself I should attend or what will be my takeaway.My expectations/objectives in attending BNLF were two fold- First-to take home some practical tips about blogging that I am not aware of yet or I am not doing it effectively so far. Second- to meet other bloggers I haven't met so far. Just about 10 days before the event I spotted a return ticket of Rs 6000+ on spicejet and took a decision to book on it and fly to Mumbai to attend BNLF. It has been over 5 years since I last visited Mumbai and finally I had an excuse. Considering all that I got from Indiblogger this year (got to travel to Bangalore, Pune and Ahmadabad for Oyo rooms and Tata Nano events and one more coming up next week), and because of personalized mail from Renie made up my mind to attend it and registered, We had clear instruction not to take any photos when session is in progress- so didn't even carry my main cameras. This post shares my notes from the event and what I felt. Would I attend this kind of event again? Yes, but only if travel cost is low enough. 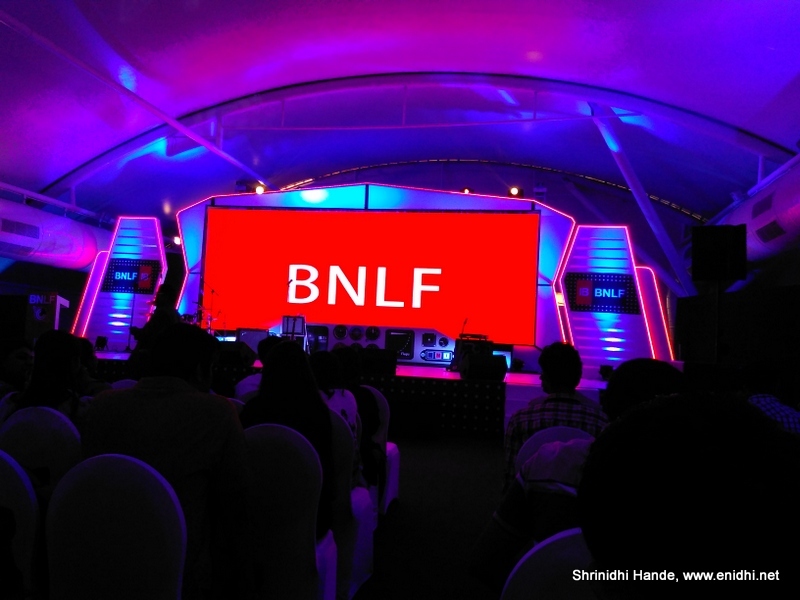 BNLF was 2 day event. Day 1 was when maximum crowd was. I went to venue directly from airport- but gates were not open on time and those who came early had to wait outside- this gave a perfect excuse to try out Cleartrip Activities. I had to show my pass at the registration counter to get the tag with lunch coupon, someone asked for my age proof and gave me a drinks coupon for use during after even party (which I didn’t go to). Later once we went inside we were greeted to an aircraft like theme. Lots of thinking has gone into conceptualize the event, prepare materials and execute it. We took our seats and waited for program to begin. There were no sponsor logo on the stage-means IB could command enough respect that two sponsors didn't insist on having their logo everywhere. Anoop began by stating that Indiblogger had more meets on shampoos and stuff than about blogging and this event is conceptualized to focus on Blogging. First was a rock show. I am not a big music fan- made an attempt to interpret and understand the lyrics. Instead of using lights, well designed video/animation was played in the background,which had almost the same effect as real disco lights. Next was talk by Purba Ray, who was introduced to audience by BlogwatiG. Purba entertained audience by satire filled talks. - Do not dilute your stand often just to suit popular public perception. Stick to what you believe in. - Mind your language. Criticism is OK but abusing anyone is NOT. - He gave up better paying jobs because they were not accommodating of his passion for his blogging. Current job, though less paying, helps him maintain his blog in parallel to regular work. Christop Trappe was next. He spoke about story telling. He mentioned the 60-30-10 Rule- Spend 60% of your time writing and researching posts, 30% time interacting with your audience, responding to comments, commenting on other blogs etc and spend 10% of the time on link sharing/promoting your blogs. Anshul Tiwari spoke next on his experience running a blog on social cause (YouthKiAwaaz) and building a team and platform to support it. Kannan Gill spoke next. He talked a bit about his failures & struggle and eventual success. His slides also had a bit of satire and humor, but I couldn't follow him fully. Jeff Bullas came on stage next- he talked about using tools to automate stuff- like link sharing. He suggests sharing a link again and again at regular intervals, at various times. I don't fully agree with this though- it is a quantity vs quality debate- I am not in favor of dumping lots and lots of tweets with links on my followers with a blind home that someone will click on it. Most of my hard earned followers follow my blog regularly and are likely to have read a new post on its first few days. Bombarding them with links of old posts is very likely to spam and annoy them. -Don't wait to be perfect. Publish regularly even if it is not fully perfect. -Lots of people on this world are introverts. But introverts make great bloggers. Preeti Shenoy talked about her struggle as an upcoming author and how successful she is. Some audience asked dumb questions to her- like why not try self-publishing? To which Preeti gave right answer- if you go by an establish publisher, that automatically brings in lots of credibility, as someone has verified your work and decided that it is worth publishing. Plus lots of money is earned in advance and other loyalty from well-established publishers. Someone asked her how much Preeti makes per book. She replied 8 digits, which is 1 crore or above. That is pretty decent money to make. But Preeti didn’t stress upon the importance of reading lots and lots before beginning to write. Author Kulpreet Yadav did a better job on that front in providing more practical tips to hopeful writers in one of his quick workshops I got to attend in Chennai. Last session was very interesting. Iron Maiden's Bruce Dickenson spoke about his way of doing business- where he attempts to create 0+0=1. Though nothing specific to blogging, his ideas were good and talk was very interesting. He explained how European airlines will have idle planes in winter which can be rented for cheap and used for his world tour, how picking up a phone and talking is more effective than emails, how one should create fans and not customers and so on. He signed off stating he doesn't use twitter. #BNLF trended on twitter on Day 1, marking its overall success. Got ClearTrip Coupon worth Rs 1500 at the end of the day and event T shirts. Event ended by about 7PM. We were told after event party would start in an hour. Didn’t see a point hanging around for one hour, so went to my hotel Silver Inn) and slept. Day 2 was supposed to begin at 10.30 AM. I woke up at 6.30, got ready, waited till 7 AM for breakfast to open, stepped out. My idea was to explore Sanjay Gandhi international park. But while the park boundary was pretty close, park main entrance was far. So after spending few moments at Panvel lake, I came back, hopped into Metro and took a return ticket to last station. Audience for Day 2 was less than one third of Day 1- Few responded it is because of freezing AC, but real reason could be that most of local bloggers felt networking they did on Day 1 is enough and since the takeaway from sessions were not extra ordinary, visiting again Day 2 is not required. Day 2 had two workshops- one each from Trappe and Jeff. Attending these workshops at best served as a refresher to whatever I already knew. As per agenda we are supposed to get a certificate for attending this event- we were told it will be sent later. Several group photos were taken. What are the common mistakes blogger do that reduces their chances of success in a campaign/contest? About an year ago Indiblogger did publish some insights. I request them to add this to the agenda of next BNLF event where Indiblogger team will share some insights. 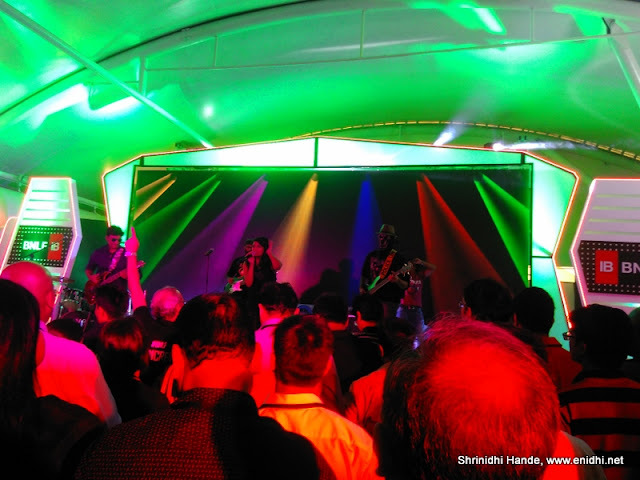 Good work by Indiblogger putting together a massive show line BNLF. Met a few members of Indiblogger core team and lots of interesting bloggers. Left for airport by Sunday evening. I learnt that another BNLF will be held in 2016, probably in Chennai. Will be looking forward to that. Glad I met up with you! Most blogging books and events are like that -- they focus on inspiration than technique. Even if they talk about technique, there is more of misguidance than guidance. I guess the best way to learn is by self experimentation. Very well explained...I wanted to attend this event, but had to cancel it last minute. Hope we will connect sometime next event.